I never have this problem on a fingered note crossing.. I guess how do i get a deep G without it vibrating to much?? Thanks and hope the New Year is going well for everyone..
open strings vibrate more than fingered strings. It's because the padding on your fingers is softer than the nut on the fingerboard. You can use more finger pressure to compensate and less pressure with the bow. Also, you can cheat a little bit by barely touching the G string right by the nut to reduce the volume of that open string. I like the trick of barely touching the string at the nut..I feel the open G at the beginning of the piece needs good bow pressure for a deep G tone.. So what your saying is touch the string at the nut like your playing a Harmonic? Kind of, yes, just not in the location of a harmonic or that's what you'll get. It's crazy because i can shift down to 2nd position and grab that G harmonic almost perfect every time now but i can't get a nice open G after a quick F on the D and back to open G..
Do me a favor and paste a screenshot of just the measure or mearsures you are referring to. It's hard for me to figure that out. I'll finger it and explain how I do it. Hey Fiddlerman its the end of the third and beginning of the fourth..
After watching her tutorial i think she wrote the music wrong she plays and A on the G then an open G.. I was playing 2 open G's.. Right around 8:25 she wrote it wrong and i was playing it wrong! !Its a very detailed video for sure.. But in this situation i would still have a problem! @johnnyblaze and @Fiddlerman - that ( the detail ) is awesome guys. WAY beyond me in any sort of technical ability - but I "get" what you're both saying. That's exactly why this site ROCKS ! And yes, even to me, going back to one of the points - open strings sometimes "sound out of place" because of their unexpected presence and ringing, and yup - I don't always do it- but I got the tip from FM to "dull" the sound/ringing by a light touch on the string at/over the nut.... it works - but I have "other basic things" that take over my concentration while I'm playing.... ( LOL ) - great thread about what is effectively "subtle detail" (to me) - thanks Blaze and FM. On guitar ( my long time instrument ) - I'll often deaden a ringing string/strings with a light touch ( so not the same as a string being bowed, where you may get a squeaky and unexpected harmonic - it's just to "dull" the vibrating string ) - but a similar idea. Sorry, that is unclear to me. 3rd what? There is a shift to 3rd on the downbeat of the first measure after the pickup. A shift back to 1st pos on the second to last eight note in that measure. Again to third on the 4th eight note in the next measure. I think you are correct. 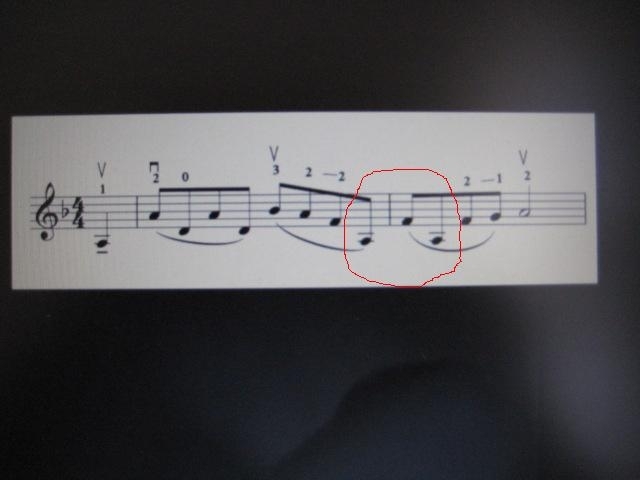 That 2nd low A should be a G.
I'm not exactly sure what you're asking, but I think you are saying that the open G is continuing to vibrate after you play that note and have moved on to playing the F on the D string. I played the short section that you gave as an example (replacing the incorrect A with the correct open G in the second measure after the pickup) where it goes (or should go) F,A,F,G,F... What I do (and I didn't even realize I did this until I paid attention) is to play the F with the 2nd finger, then play the A with the first finger, then back to the F on the 2nd finger, play the open G, allow the 1st finger to lightly rest on the A note on the G string while I play the next F, then slide up. That mutes the G so that it doesn't sound while you are playing the F.
I hope I answered the right question and I hope it works for you if I did. Yes Uzi i was playing open G F open G because i was reading the music wrong but she also wrote that section wrong but she played it right in the video! !